This is an older piece, but given that Lonely Planet named northern California’s redwood coast as its #1 destination in the U.S. for 2018, I figured it is worth publishing again. Come see us! California is a big state. In the same time it takes to drive its length from Oregon to Mexico, you can drive from North Carolina to Maine. So it makes sense that there are plenty of things to do and see in a state the size of California. From beautiful beaches to great skiing, from the bustle of downtown San Francisco to tranquil, awe-inspiring beauty of the state’s numerous national parks, California has it all. Yet, for a state as large and diverse as California, some people seem to think it only consists of either greater San Francisco or greater Los Angeles. San Francisco is the heart of NorCal while Los Angeles is the heart of SoCal. There is a playful NorCal vs. SoCal rivalry of sorts. SoCal may have Hollywood and Disneyland, but it has to steal all its water from NorCal. But there is a problem with this description: the bulk of the “NorCal” people aren’t even in NorCal! There you have it. 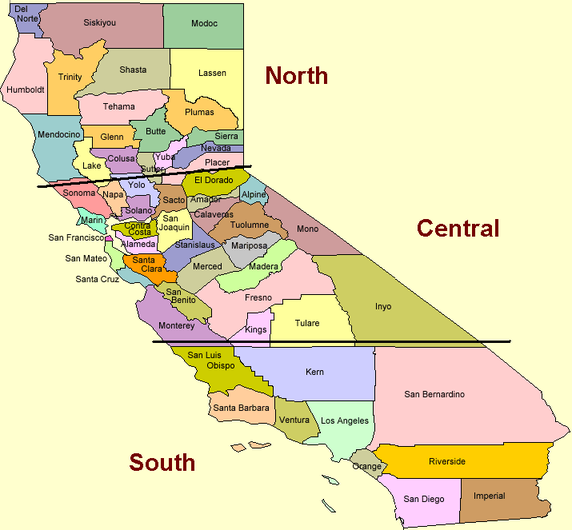 These are the divisions of California. Yeah, those lines are completely arbitrary. But I agree with them, so they must be accurate. Now let me direct your attention to *real* NorCal. You may be thinking: “But there’s nothing up there!” Fine. Don’t agree with me. But at least give me a chance to show you that you’re wrong and convince you to visit coastal northern California. Coastal northern California is a place of wondrous natural beauty. It is home to the tallest trees on earth. The coastline is more rugged and scenic than almost anywhere else in the country. People do come here from not only all over the U.S., but from all over the world. There is plenty to see, do, and experience. The Redwoods – These are the gem of northern California. The best of the redwoods are found in Redwood National Park, Prairie Creek Redwoods State Park, and Humboldt Redwoods State Park. One of my favorite hikes is the James Irvine Trail, starting from the Prairie Creek Redwoods Visitor Center and culminating with spectacular Fern Canyon. Other favorites of mine include the Ossagon Trail in Prairie Creek Redwoods State Park and Grasshopper Peak in the Humboldt Redwoods State Park. The Lost Coast – This pristine stretch of coastline is called “Lost” because it is ruggedness and isolation. It is so daunting, the road engineers left it alone. The southern end begins where Highway 1 ditches the coast and heads inland to meet Highway 101, and the northern end is generally considered where the Eel River Valley meets the ocean. It’s roughly 75 miles of untamed coastline. There is a 100-mile paved loop through Petrolia and Honeydew that lets you experience the sheer ruggedness of this stretch of coastline from your car. It is still one of my absolute favorites drives, and it begins virtually at my doorstep. Two pieces of the Lost Coast, the King Range Wilderness and the Sinkyone Wilderness, contain some pristine hiking and backpacking opportunities. Highway 1 – This is one of the most scenic highways in the country. Highway 1 splits off from 101 just north of the Golden Gate, and the section through Point Reyes National Seashore is lovely. But it gets even better as you head through northern Sonoma County and on into Mendocino. In many places it feels like the road barely clings to the coast, as the cliff drops off next to you straight into the Pacific. If you come for just one reason, visit coastal northern California to drive Highway 1. Ferndale – Affectionately known as the Victorian Village, Ferndale is a tiny town with a big reputation. The buildings of Main Street are straight out of 1900. As it is my hometown, I too often take it for granted. Ferndale has been featured in numerous travel magazines and web publications. To me it is simply home, but every summer I am reminded that it is a destination. People visit from all over the globe. Ferndale is (was?) even featured at Legoland California, alongside model cityscapes of New York and San Francisco. We’re that awesome. The State of Jefferson – If you visit before we secede from the rest of California, you can say you’ve already been here. Or you could just come back for a second visit! Ok…this is extremely unlikely, but the idea has been discussed for decades now. We really are California’s better half. I mean…third. SoCal can keep San Francisco. Coastal northern California is my stomping grounds; it is the place I will always call home. Too often I take the beauty of our isolated pocket of the world for granted, forgetting that it draws tourists from around the world. It isn’t a place that is on many people’s radar, but it really should be. The area has a lot to offer. So plan a visit coastal northern California. Come see my exquisite neck of the woods. You won’t be disappointed! Highway 1 image under CC 3.0 license. I would love to explore NorCal! Perhaps you can post an insider’s suggested itinerary with some recommended accommodations. Hi, yes, on the way up Highway 1 as you get to the Point Arena Lighthouse, there are cottages for rent at the entrance, mystical location, trees and birds and ocean air. Then go to Fort Bragg, California, just north of Mendocino Township. After you visit Mendocino’s organic stores, the best custom made candy shop, coffee comfy’s, come to Fort Bragg just north a few minutes. Lots of nice hotels along the harbor of Fort Bragg or looking out on the ocean from the harbor entrance cliff. Then spend hours walking the new coastal trail called the Headlands. Enjoy your lunch on a table there with the waves crashing below, and there are lots of Angels here too. Thanks! I’ve only been as far north as SF. Looking forward to exploring the more rustic beauty of the north 1/3 of the state! Hey Amy, Scott has great suggestions regarding Fort Bragg and the Mendocino Coast. Touring up Highway 1 is one of the best trips you can do. My personal hotel suggestion in Fort Bragg is the North Cliff Hotel. If you want to continue up further north, consider stopping for a day and night in Victorian Ferndale. Tour the shops for half a day. My favorite is the Golden Gait Mercantile. Grab lunch at Humboldt Sweets, or maybe Ferndale Pizza for some great Italian food. A great place to stay is the Gingerbread Mansion Inn. Then continue on north to Redwood National Park. I don’t have any lodging suggestions since I’ve always camped when visiting the park. There is a *ton* of great hiking, with plenty of variety for easy half mile walks, to all day strenuous loops through the redwood forest. If you’re feeling really adventurous, head on up Highway 101 on into Oregon. There are some great spots in Gold Beach, Port Orford, and Bandon. The coastal drive between Brookings and Coos Bay is beautiful. All great suggestions! Thanks so much. I can’t wait to get started with the planning! Also, don’t forget about Patrick’s Point. It can be hard to book but it is a great camping ground with a lot to do!! Fun and interesting post. I can see why natives would split it in three parts but to most outside the state the NoCal part starts about where you draw he line between South and Central. Sorry that we include cities like SF in the North. Maybe it’s a weather related issue. I love Northern and well… even parts of Central California, now know at CeCal. I think someone else wrote this piece. “Cali”is a bit like fingernails on a chalkboard. Hey, Nick. Daniel is right. Native Californian here. There was no way I was gonna spill a “Cali” or “Frisco”. But I will fight ya on my delineation. I’ll never lump the Bay Area into NorCal. It’s not Northern California by this map but there aren’t many finer places to visit on the coast than Point Lobos State Park near Carmel. Rocky coastline, tidepools, otter, sea lions and more. Plus it’s right off highway 1 so easily accessible. Last time we were there (July 2016) we saw whale spouts off the coast. @Dano – I watched whale spouts at Point Lobos State Reserve yesterday morning. Gray whales migrating south to Mexico. @Ian – Moved to Arcata in 1982 for Humboldt State University and returned in 1989 for a teaching credential and graduate work in Political Science. Lived in Eureka and worked as public school teacher in Cutten and Fieldbrook 1996-2001. Lost Coast is phenomenal hiking experience, walks in redwood forests and Clam Beach fond memories. Obviously Ferndale is picture postcard town. Do yourself a favor, and hike at least one of the major Redwoods parks. We did a 14 mile (that was marked as 10) hike and at the time it was the greatest Hike I had ever done… and its surprisingly quiet for being so beautiful. Very few people and serene as Heck. Wait until you discover that the Midwest, *gasp* is actually the Mideast of the US!